I’m currently working on a project which requires me to make lots and lots of swatches. Normally, identifying which swatch is which would be done with paper tags, like the pre-strung ones you can get at any office supply store. However, not only must these swatches be wet blocked, there are also several of the same color, which can lead to identification problems. I seem to recall that paper and water don’t mix, so trying to keep track of similar swatches was going to be a problem. And then, I had a lightbulb moment. What if I can make hook size markers and attach them to the swatches? 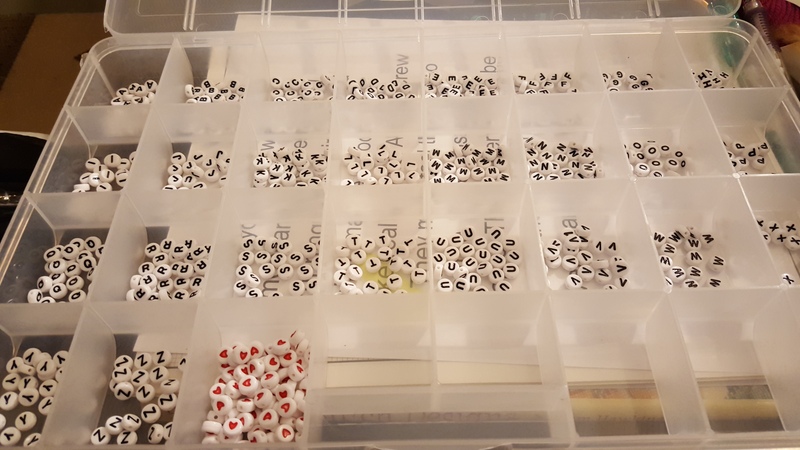 Off to the craft store I went to purchase alphabet beads, beading wire, and crimp beads, as well as a large enough storage case for sorting out all the letters. I got home, and after a couple hours of television, I had this. Now, crochet hooks in America have letter designations from B to S, but for this first run, I concentrated on C to J. 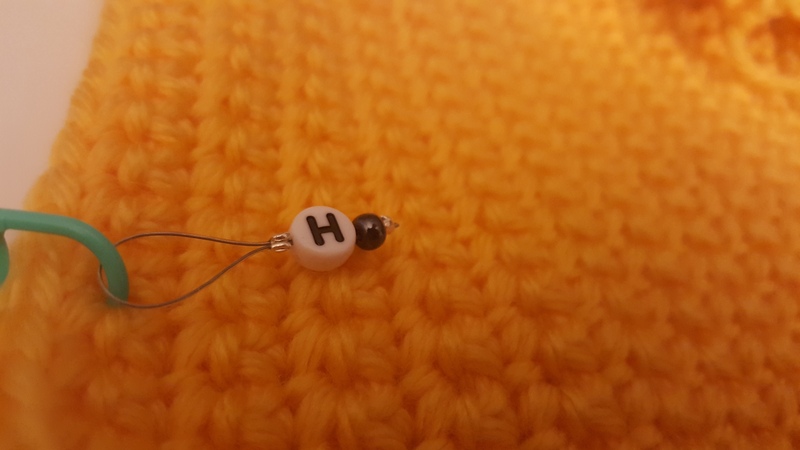 Now, a smart crocheter is going to point out that letters are well and fine for MOST of your hook sizes, but what about that US 7 / 4.5mm hook you are so fond of using? How are you going to create a marker for that one. First – Kudos to you for sussing that out! Second – see those little hearts? That is my stand in for the US 7 hook. After a couple more hours, I had this. I had LOTS of extra beads, so I decided to make my markers a little prettier by adding a bit of color. 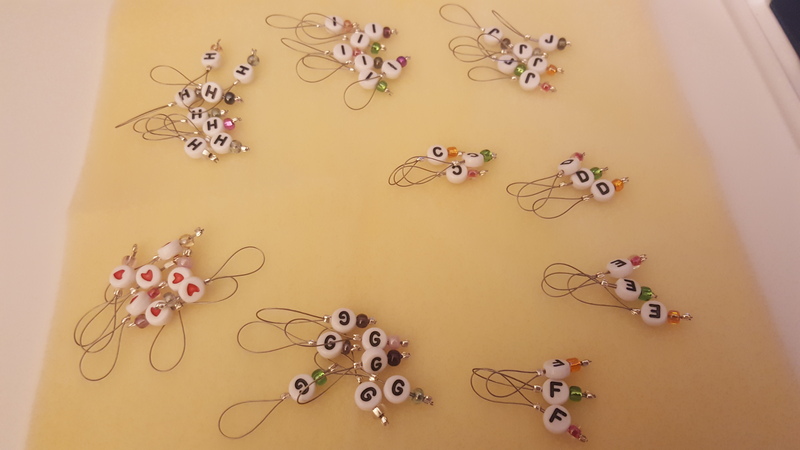 The loop gets put on a locking stitch marker, the stitch marker is attached to the swatch, and swatches are ready for their bath without losing important information that I need. I’m really happy with how they came out, and they should prove to be a great help with this project. Have you ever had a brainstorm of an idea to make your crocheting better? Please share! This is a variation on an idea I saw somewhere else. Yours works better because the hole in my bead is too small to slide it directly on to that clip-on marker. Thanks for helping find a way to do this, so I can mark each WIP with the size of the hook I am using. Yeah! !